Well we’ve made it through Thanksgiving dinner, almost made it through the leftovers, Black Friday has come and gone, Cyber Monday was in and out like a flash, and now it’s time to Deck the Halls with some good ol’ fashioned common cents decorating ideas. Not that’s not a typo- you read it right. Cents. Because that is just about all I have to spend on my holiday decorating this year. I was in about the same shape last year, and as the Christmas holiday quickly approached, I began to panic like no other. I had absolutely no idea how to turn my humble home into a magical winter wonderland on a budget. Well this year, you and I are both in luck! I’ve been asking seasoned holiday decorators, (Mrs. Claus, Grandma, and a few of the lady elves) for some advice, and you will never believe the fun idea’s they helped me come up with! Get out your pen and paper (or your smartphone will do) – you’re going to want to take notes. Old Christmas cards make wonderful holiday decorations, and the best part about it is that they are F-R-E-E! Gather up your cards from Christmases past, select a plain or fancy (your choice) frame from your local five and dime, and create a beautiful Christmas collage complete with heartfelt verses, sparkles, and all of your favorite Christmas scenes. Remember those festive pillow covers Grandma used to make? Well those kinds of Christmas decorations always bring back the best holiday memories, so why not make a few of your own? Grab some colorful holiday fabric, place your pillows diagonally and wrap the fabric around tying the lose corners in a knot. Tuck in the ends and voila! 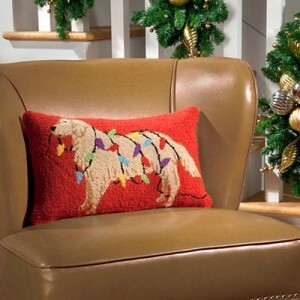 Or of course you could make it easy and buy this adorable Retriever with Ornaments Decorative Pillow! Christmas ornaments aren’t always just for the tree! Collect old ornaments, and order a few new, personalized ornaments, and arrange them on bookshelves, mantles, in display cases, and anywhere else you can think of to create a touch of holiday cheer throughout your home. Be sure to string Christmas lights and garland near focal points to draw attention to your arrangements. 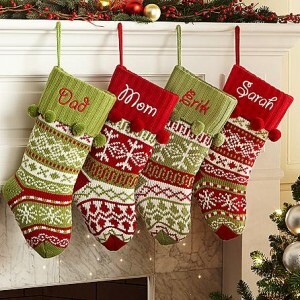 One of the most festive decorations you can put in your home is a group of personalized Christmas stockings. They don’t cost much so you’ll have plenty of cash left for your holiday shopping, and they make a big statement when grouped together around the tree. Don’t forget to add a touch of holiday cheer outdoors as well this Christmas. In addition to lights and greenery, you might consider investing in a few adorable yard decorations as well. 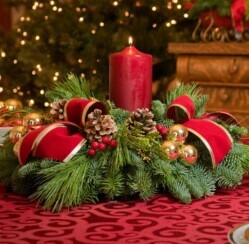 What great decorating ideas do you have this holiday season that won’t break the shopping budget? Have you ever tried making your own Christmas decorations? Be sure to send us your comments- we love hearing from you!